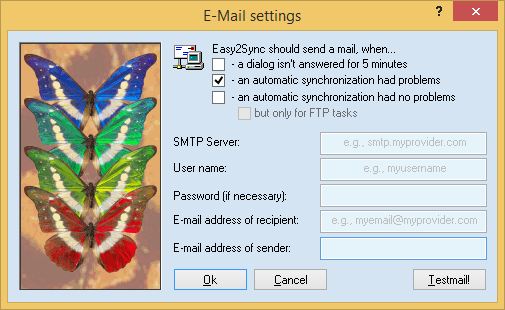 You can let Easy2Sync for Files send you e-mails at certain events. For example when a sync was run with or without problems or when a dialog wasn't answered. For this, enter the data of your e-mail server and account into this dialog. If your mail server requires this, you can enter a user-defined port. Simply append a colon and the port after the server name, e.g. "smtp.myprovider.com:12345". You can have Easy2Sync send the status e-mails to multiple recipients at the same time. Enter multiple values in each line, separated by ";", like value1;value2;value3. However, the second (third, fourth, ...) value of each field (e.g. username) should make sense together with the (second) value of the other fields (e.g. password). If a value is always the same (e.g. your SMTP-Server), it is okay to enter just one value there.